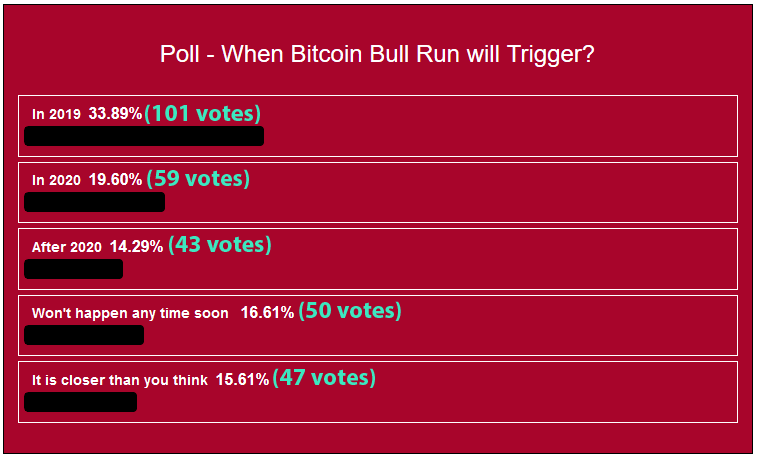 300 of our readers attended the poll and expressed their opinions regarding the next Bitcoin Bull Run. The results are calculated below. Sometimes it is easier to know what crypto-celebrities, traders, investors, and other famous people thinks about the next Bitcoin Bull Run rather than what regular people, as we at Cryptovibes.com, think. Our team has carried out a reader survey for 10 days with a question ‘When Bitcoin Bull Run Will Trigger?’, and today we share the results what our reader think. The survey should preliminarily reflect the overall market opinion but should not be accepted as financial advice or investment suggestion. Every investor should do his own research before investing in any financial asset. Please note, that the majority of the votes where accepted while Bitcoin was trading sideways in $3500-$3600 range. 101 out of 300 reader (33,89%) think that the next drastic surge in price will happen in 2019. 59 (19,60%) thinks it will happen in 2020. 43 people (14.29%) expressed that the Bext Bitcoin Bull Run most likely happen after 2020. 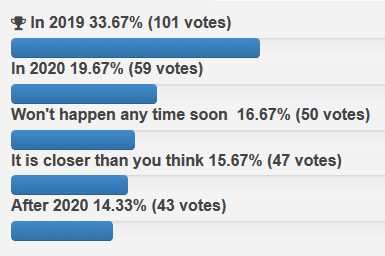 50 voters (16.61%) said that it won’t happen any time soon and 47 cryptocurrency fans said that the next Bitcoin Bull Run is closer than you think. 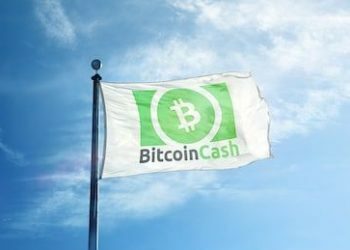 To sum up the results it is clearly visible that crypto community is in a positive mood regarding the near Bitcoin’s future more than 33% (101 votes) of all voters are indicating Bitcoin to resurge in price drastically in 2019 while only 16.61% (50 votes) said that Bitcoin won’t ‘rocket’ in the near future. The results might also be impacted by upcoming the events in Cryptocurrency world. The March 2019 might be the most important and booming month in whole 2019 for all cryptomarkets because of possible Bakkt and Fidelity launch, Rakuten Pay App launch, Bitcoin ETF and even more to follow. Can’t wait to see what the future will bring us. We appreciate all your shared opinions. Big thanks for participating.